Merry Christmas! You may enjoy Christmas holidays, while we, boxing people in Japan, are going to be more and more occupied in the end of the year to cover seven world title bouts on the last two days this year. Unbeaten Naoya “Monster” Inoue, WBO 115-pound champ, will take on former WBA super-fly titlist, compatriot Kohei Kono to defend his belt for the fourth time in Tokyo on December 30. Also, on the same show, his stablemate and IBF 108-pound ruler Akira Yaegashi will defend his throne against Thai challenger Samartlek Kokietgym in his second defense since he dethroned Mexican Javier Mendoza by an upset decision last December. Today we saw a deluxe press conference where all the star participants appeared before our press people to show and express their good preparation and hot motivation. 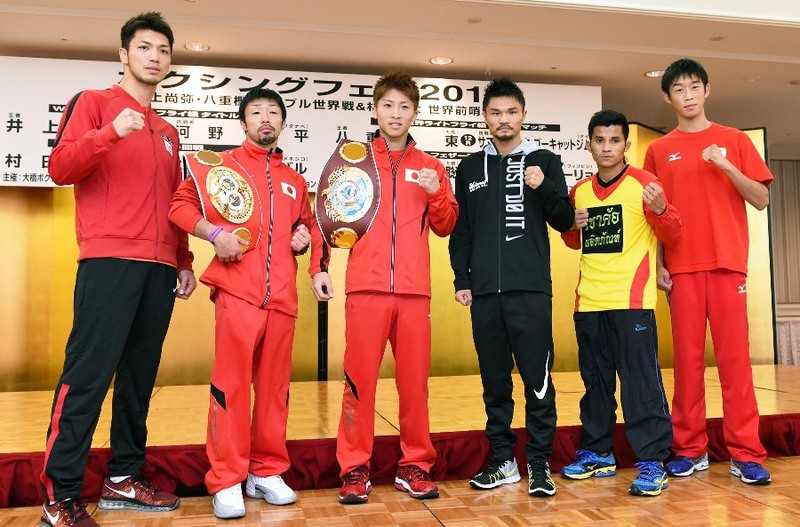 Also appearing on the show will be 2012 Olympic gold medalist Ryota Murata who will face Mexican Bruno Sandoval. Satoshi Shimizu, an elongated bronze bantamweight medalist of London Olympic Games, will cope with Filipino Carlo Demecillo in a feather eight-round contest of his second pro bout. We will see seven world title bouts on the last two days of this year?two in Tokyo on December 30, plus two in Tokyo, one in Gifu and two in Kyoto on New Year’s Eve.